Serving Fort Myers, Cape Coral, Naples, Bonita Springs, and Estero With almost 30 years of legal experience, the law office of Thomas M. Dryden, P.L. has a strong reputation within the Fort Myers, Florida area for helping clients through challenging legal experiences. Our practice focuses on the areas of real estate, construction, condominium, business, probate law and civil litigation, including: -Negotiation, review and preparation of real estate contracts and mortgages -Preparation and handling of real estate closings -Issuance of title insurance -Real estate litigation, including deposit disputes, specific performance and foreclosures -Landlord/tenant law, including lease preparation, dispute resolution and litigation If you are in need of an experienced Southwest Florida attorney for seasoned legal advice or for matters related to real estate, business, trusts and probate law, or effective resolution of disputes through negotiated settlement or litigation, contact our law office today. Highly experienced real estate and business law attorney Our dedicated and experienced team of legal professionals is committed to providing quality representation for all our clients. We have been practicing civil law in the Fort Myers area since 1984 (licensed since 1982). Thomas Dryden has been Board Certified by the Florida Bar in Real Estate since 1996. Over the past 30 years, we have handled multi-million-dollar commercial and residential transactions. We have also handled lawsuits involving liens, construction defects, evictions, quiet title, foreclosure and foreclosure defense, breach of contract, association disputes, trust and will disputes, and insurance matters. The Law Offices of Thomas M. Dryden has also handled hundreds of lawsuits, concluding in settlements or bench or jury trials. In a recent construction lien and fraud jury trial case that lasted four days, we obtained a $550,000 judgement for fraud, among other claims, against a real estate property owner and its principal Thomas M. Dryden, P.L. has a busy staff consisting of two full-time legal assistants and one part-time assistant, who each have an area of expertise. "It is important to my staff and me to stay accessible to our clients and provide the best legal representation possible to keep our clients happy, often under expedited and difficult circumstances". Experienced Fort Myers real estate lawyer At The Law Offices of Thomas M. Dryden, P.L. in Fort Myers, Florida, we apply our extensive knowledge about property rights, real estate issues, finance and business to all areas of real estate law. With more than 30 years of experience in real estate law, The Law Offices of Thomas M. Dryden, P.L. can help you with: -Residential home sales transactions -Commercial property sales transactions -Homeowners associations -Condominium law -Landlord-tenant disputes -Evictions -Foreclosures -Real estate contracts -Title disputes Real estate transaction attorney From offer to sale in both commercial and real estate transactions, attorney Thomas M. Dryden handles all aspects of buying and selling real estate and construction law, so that you can feel confident about a smooth and precise transaction. Our firm can: -Draft or review your sales contract -Negotiate real estate agreements -Review your lending documents -Search and clear title -Analyze your deal and rectify potential problems -Conduct your real estate closing Real estate litigation attorney Real estate litigation requires substantial knowledge about property laws and civil litigation, as well as a dynamic courtroom presence. At The Law Offices of Thomas M. Dryden, P.L. we possess the specialized knowledge necessary to successfully litigate your real estate disputes. We handle lien and mortgage foreclosures and defense of same, as well as contract enforcement and deposit recovery/defense claims. We also handle all real estate matters in litigation. Real estate negotiator Some disputes are better solved outside of the courtroom. Attorney Thomas Dryden has negotiated hundreds of mediation negotiations and has the experience to protect your interests. By retaining an experienced attorney to strategize during the contract negotiation process, you can often prevent disputes from arising at a later stage in the real estate transaction. This can save time, costs and frustration. Thomas Dryden is the President and owner of Thomas M. Dryden, P.L. His law practice specializes in the areas of real estate law, business law, probate and litigation. 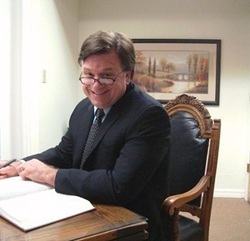 He has been practicing law in the Fort Myers, Florida area for almost 30 years. Tom was admitted to the State Bars of Georgia and Florida in 1982. He has been Board Certified in Real Estate Law by the Florida Bar since 1996 and Commercial Law League certified in Creditor's rights since 1996. He is a member of the Lee County Bar Association and the Middle District Federal Court of Florida. Tom graduated from Clemson University with a Bachelor of Science degree in Management. He received his Juris Doctor degree from the Walter F. George School of Law at Mercer University in Georgia. Tom is a past Board Member of the Lee County Humane Society and an active member of the Kiwanis International Metro-McGregor Chapter and the Fort Myers Hispanic Chamber of Commerce. In his free time he enjoys football, traveling, history and spending time with family.